Love makes the world go around! I love this saying, and Monica and Lukas’s love is living proof. They met at a university in Mexico, fell in love, and decided they want to spend the rest of their lives together. Their love is so big that not even the hurricane could stop their wedding plans! They were planning their wedding for May 2015, but the hotel that they booked to host their wedding at first was damaged so badly that the repairs wouldn’t be finished by their wedding date. So we started working on a new solution between Los Cabos and Sweden to make their day the best day ever! Monica and Lukas trusted me and my recommendations for their new wedding location completely, and I am so grateful for that. They visited Cabo San Lucas for a site inspection twice, first to choose the location and vendors, and second time – for the most delicious part of the wedding planning – food and cake tasting at Pitahayas restaurant in Cabo del Sol community. Monica and Lukas are an amazing couple, and I am thankful that they chose me to plan their wedding. They are beautiful, loving and friendly, and such was their wedding day! Their friends and families accompanied them for the celebration of their wedding day from La Paz, Sweden and many other parts of the world, and enjoyed the celebrations until the end. 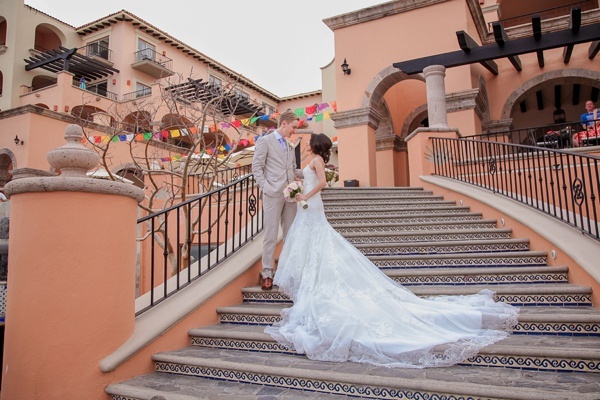 Monica and Lukas’s Cabo destination wedding turned out just as they dreamed of, and I dare say even more special because of everything they went through because of the hurricane aftermath. I’m glad they still decided to continue with their wedding plans in Los Cabos, and support the destination. They enjoyed their day a lot, and I’m so happy to be part of their special day.